Exploring New York is much more than just visiting the main sights of Manhattan! New York city is in fact made up of 5 boroughs: Manhattan, Queens, Brooklyn, Staten Island and The Bronx! These other 4 boroughs sometimes get left out and are just as much a part of what makes New York amazing! Each one has its own character and history and exploring them all is an off the beaten path challenge we just had to do! Some people might be surprised to learn just how small Manhattan actually is, especially compared to some of the other boroughs as well as just how close they all are…with exemption to lonely old Staten Island down there! 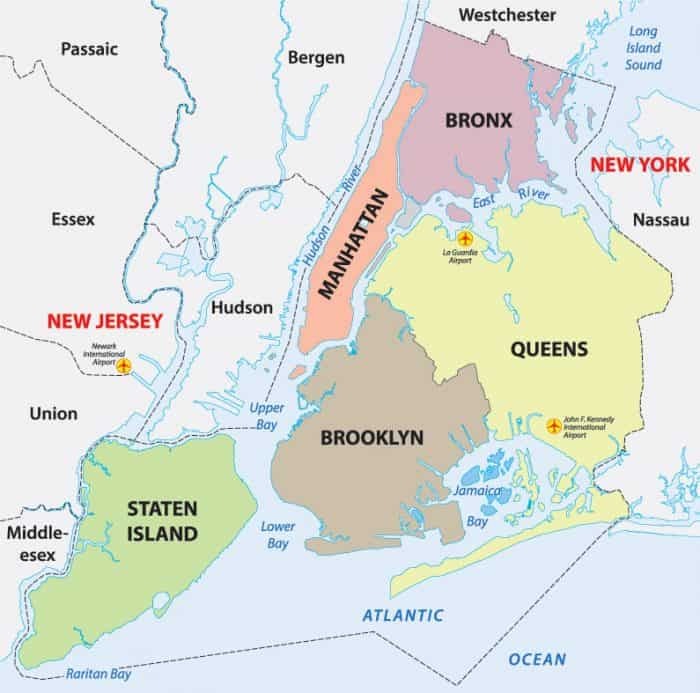 The Bronx is the only part of New York city which is connected to main land USA, with Staten Island and Manhattan being islands in their own right and Queens and Brooklyn being located on Long Island! Most people who have visited New York will of course have been to Manhattan…I assume! But many might not realise that if they flew into JFK or La Guardia then they will have also been to Queens…although not properly! Then there is of course the fact the Newark is over in New Jersey! Of course, being a city of Islands New York has many bridges connecting these boroughs together. The most famous include the iconic Brooklyn Bridge, the historic Manhattan bridge and the legendary Queensboro bridge and not forgetting the George Washington bridge and the Verrazano-Narrows Bridge over from Brooklyn to Staten Island! 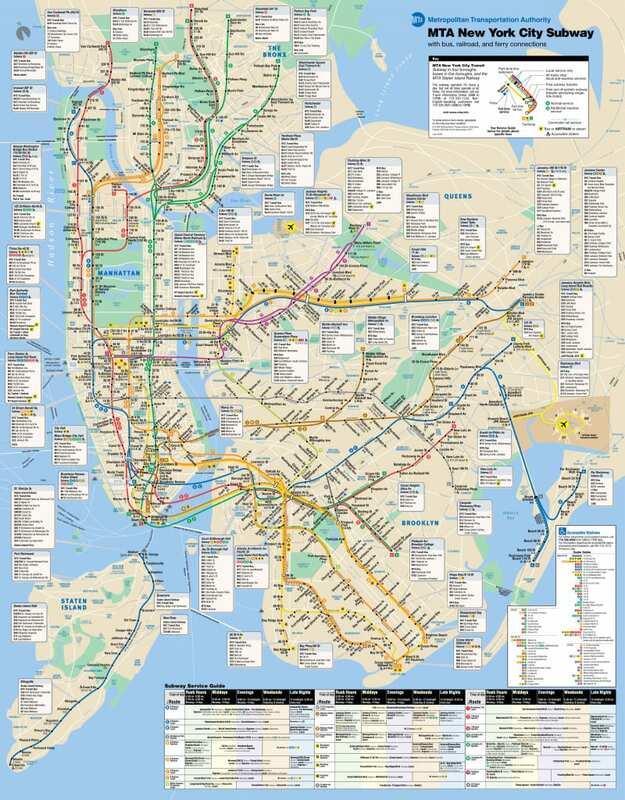 All the boroughs are well connected in terms of the NYC Subway…again with Staten Island being the exception with only one line! But hey, it does have the famous Staten Island ferry! Manhattan…well where to start! As much as this post is about singing the praises of the other less explored boroughs there is no denying that Manhattan is the centre of New York! This almost rectangular shapes island gets its name from the Algonquin language and means “Island of the Hills”. Whilst many of those hills have been replaced by the famous sky scrapers of this city, this borough has seen some of the most dramatic moments in history. From being one of the very earliest settling places in the new world to the inauguration of the first president of the US or the tragic evens of 9/11, Manhattan has seen it all. Manhattan isn’t the centre of the city for nothing though, New York originally began at the very tip of this island before expanding into the land further north and eventually into what are now the other 5 boroughs. Well, with such an amazing array of things to do in Manhattan and many amazing districts to explore it is hard to narrow it down. But here are our favourites! Play Frisbee in Central Park! Get up into Harlem and see some of the lesser know areas of Manhattan! The largest in terms of area out of all of the 5 boroughs Queens has to take it as my second favourite borough after Manhattan! Why? Well because I am an avid fan of the Mets that’s why!! But not only that but queens offers some of the most diverse activities and things to see in the city, from watching baseball to chilling at the beach, or taking in some world class street art before watching the US open final! Queens is also one of the most ethnically diverse urban areas in the world and is truly a melting pot of cultures! So take that 7 train (I even have that tattooed on my arm) over to Queens and watch the best Baseball team in the city! Cheers on the players at the US open tennis! The most populated of all the 5 boroughs with around 2.6 million residents, if Brooklyn were a city in its own right it would be the third most populous of the us behind only L.A and Chicago! It also holds the title of being the coolest borough with the hipster paradise of Williamsburg, the amazing beaches of Brighton and the famous Coney Island amusement park! Find yourself in Little Russia! See the Brooklyn Nets or Cyclones play a game! Often forgotten about Staten Island is closer to New Jersey than the rest of the city but it is also one of the least developed areas too. With some of the cities most amazing beaches and even a forest reserve making the trip over on the unforgettable Staten Island ferry is a must do! The view of downtown Manhattan from the free commuter ferry is one of the best things to do in the city for free and a great way to get an idea of the geography of New York. This suburban stretch of New York is unsurprisingly NYC’s least populated borough! The first recorded contact with the island was by the Italian explorer Giovanni De Verrazzano in 1520 – hence the name of the bridge that connects it to Brooklyn! Staten Island got its name from the Dutch “Staaten Eylandt” meaning “States Island” in honour of the Dutch Parliament, Staten Generaal. Explore the Greenbelt Wetlands, New York’s biggest forest reserve! Head down to the Franklyn D. Roosevelt board walk and beach on a sunny day! Visit Fort Wansworth and see one of the oldest military fortifications on the US! Named after Jonas Bronck who settle the town in 1639 this borough is probably the one with the most fearsome reputation and is often mis-judged. Just like the other outer boroughs it has a lot going for it and a culture all of its own. It might be seen as an example of a harsh urban environment but in fact over a quarter of The Bronx is open and green space. It is probably best known as the home of the world famous New York Yankees (booo!) and despite how much I hate the team I have to admit the sheer baseball history here is impressive. Have you visited all 5 boroughs? We challenge you to visit NYC in its entirety and get out and explore them! How to do New York on a budget and still have an amazing time! The Top of The Rock vs The Empire State Building! Which to spend your money on! Experiencing America’s Game: Baseball! A dream come true seeing the NY Mets! All together in 3 visits about a month but it has felt like longer as we have explored so much! Need to get over there again! Thanks, love that building! You and me both, on both counts. Thank you! We love exploring this city to the fullest, there is just endless stuff to discover! You always return to a place like New York so maybe next time! We’ve not been to NYC but we’re pretty sure much of this would be new information for those who’ve been there as well! Thanks for sharing! Ohh, you have to go!! Yeah its great to discover new things in this city, we love the main sights but there is so much else to see as well.